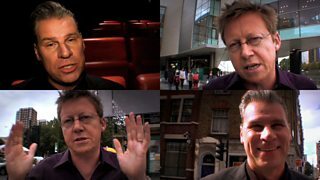 Feted as one of the finest film reviewers of his generation as well as for his impeccably-coiffured quiff, Mark Kermode presents the film review on Radio 5 live with Simon Mayo in a broadcast partnership that has lasted nearly 20 years. The hugely popular podcast of the pair is regularly downloaded by around 100,000 people a week. Watch the video to learn more about Mark Kermode.